M.Ch - Neuro Surgery, MS - Neuro Surgery, M.B.B.S. Dr. Ashis Pathak, MBBS, MS, MCh(Neurosurgery), having acclaimed experience of more than three decades, is Principal Consultant - Neurosurgery at Fortis Hospital, Mohali. Prior to joining Fortis Hospital, he was working as Professor of Neurosurgery at PGIMER, Chandigarh, where he served for 27 years and also had a career stint as Lead Consultant - Neurosurgery at Hull & East Yorkshire Trust, UK for 5 years. He is an expert in areas of Minimally Invasive Brain and Spine Surgery through endoscopic procedures. 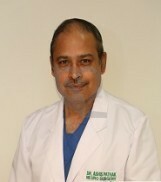 He also has a keen interest in Neuro-oncology and has performed more than 5000 neurosurgical operations till date. Dr. Ashis regularly participates in workshops and conferences to hone his technical skills in his cinical domain.